Welcome to our inaugural issue of The Improbable, a monthly collection of little reviews written by booksellers for booksellers (and readers, too) about unusual and wondrous books that live at the intersection of art and literature. In this first issue, booksellers from some of the most vibrant and lovingly curated bookstores in the U.S. have delved into books by Claudia Rankine, Ray Johnson, Susan Howe, Amarnath Ravva, Dorothy Iannone and Ed Sanders. As you might deduce from that list, we care deeply about writers and artists who obey no boundaries, pay no fealty to trends and invite readers to see the world anew by reading word and image in provocative, unfamiliar ways. We hope that with this and subsequent issues, our commitment to eclecticism will be embodied in an ever-expanding collection of books in which you might discover other, unexpected shared territory. Here's how this works. Each month we'll post 5-7 reviews on one day. Scroll down for the whole issue. The reviews are short—they're intended as a thoughtful starting place, an instigation to pick the book up yourself and share it with others. We'll often have a little excerpt from the book, too. Sometimes we've got snapshots of the books in the stores where the reviewers are writing from—it's always a delight to see what's on the shelves next to them. While we have answered a number of possible questions on the FAQ page, please don't hesitate to write us with any suggestions or ideas. You can also sign up to receive an email when each new issue is posted and/or you can keep in touch (eventually) with Twitter. Finally, a big thank you to all the reviewers, but particularly to Stephen Sparks and the staff at Green Apple Books in San Francisco whose collective enthusiasm for this project has propelled it forward—and on schedule! 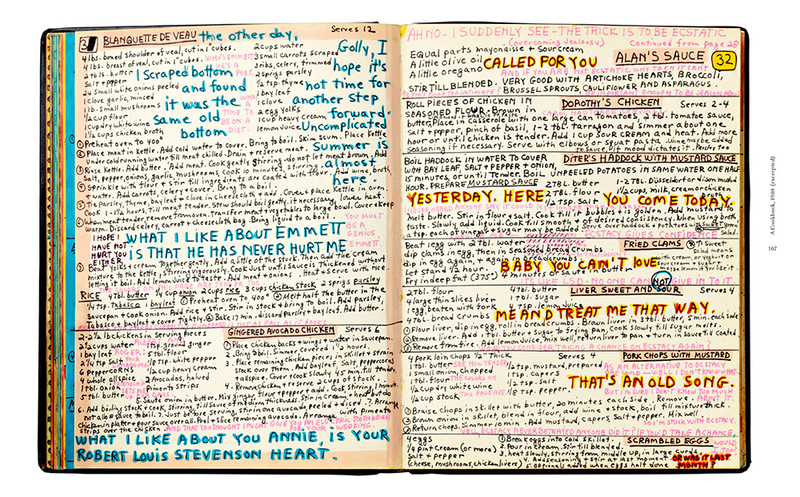 Sarah Gagnon (Green Apple Books, San Francisco) reviews Burn the Diaries by Moyra Davey (Institute of Contemporary Art/Dancing Foxes/University of Pennsylvania Press, 2014). Lauren Molina (Hammer Museum Store, Los Angeles) reviews Non Stop Poetry: The Zines of Mark Gonzalez, edited by Philip Aarons and Emma Reeves (Printed Matter, 2014). Herbert Pfostl (New Museum Store, NYC) reviews The Gorgeous Nothings: Emily Dickinson's Envelopes, edited by Jen Bervin and Marta Werner (Christine Burgin/New Directions, 2013). 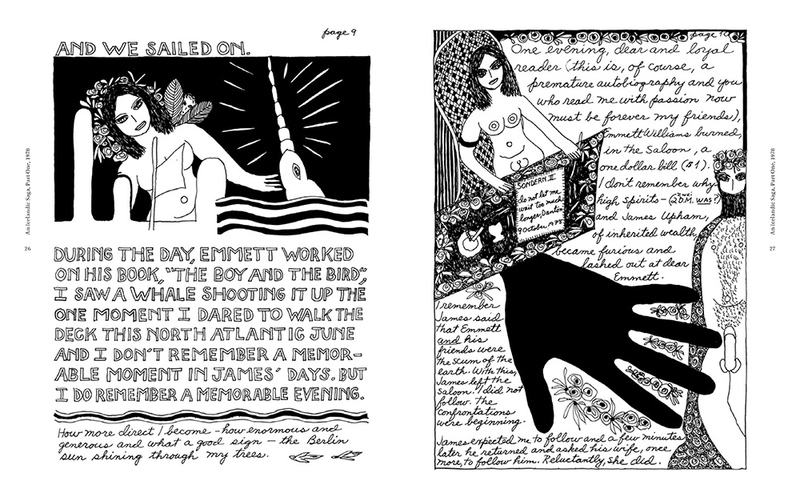 Emily Pullen (WORD, Brooklyn) reviews Bough Down by Karen Green (Siglio, 2013). Clara Sankey (Green Apple Books, San Francisco) reviews DRIFT by Caroline Bergvall (Nightboat Books, 2014). Jenn Witte (Skylight Books, Los Angeles) reviews Bad Luck, Hot Rocks: Conscience Letters and Photographs from the Petrified Forest, edited by Ryan Thompson and Phil Orr (The Ice Plant, 2014). 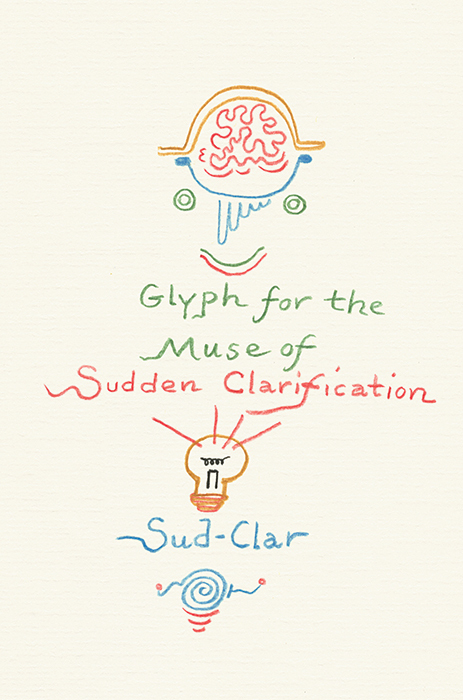 A Book of Glyphs is a tiny facsimile of a notebook that Ed Sanders filled with colored penciled glyphs while spending a few days in Florence in 2008. I think of it as an obscured travel journal. Although it does not discuss his experiences directly, it is the glyphic form of his thoughts while he was "marveling at the bustling good vibes, art, architecture, and statuary." I find myself reading this little prize differently every time I flip through it, which is often. Sometimes I'll jump in and steal an individual glyph (e.g. 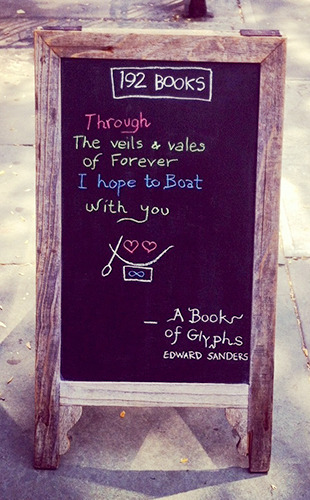 romantically: "Through/The veils & vales of Forever/I hope to Boat with you"). 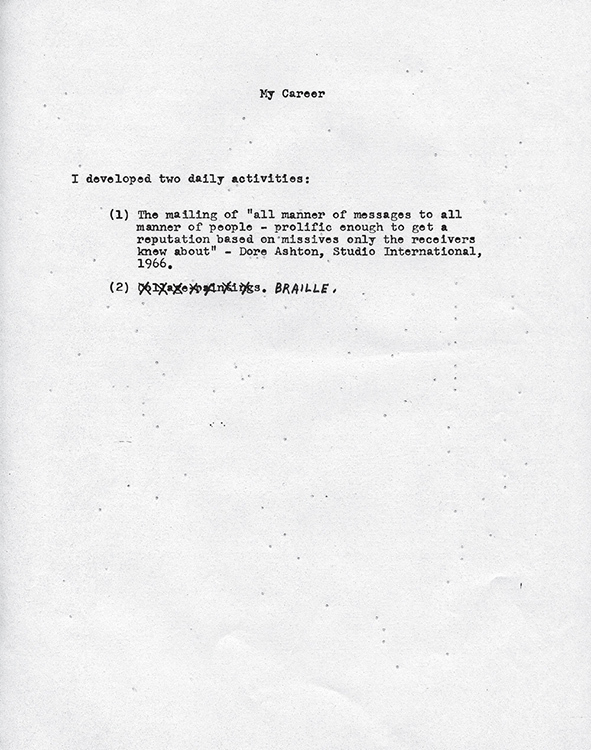 As a whole, it also creates a similar effect as, say, Perec's La Boutique Obscure, or Joe Brainard's I Remember. As with Perec’s dream journal, we watch Sanders's preoccupations take repeated form: the use of simple universal images such as ∞ for infinity, alongside more personally meaningful images such as a "Galactic Snail" and his "Baklavah"-esque lines, all of which take on greater meaning as they interact throughout the book. Reading A Book of Glyphs as one would read a list of memories is enhanced by looking through the Glyph Notes (which are available online at Granary Books) as some glyphs refer specifically to his mother, or to a childhood friend, for example. But whether or not one reads the Notes, it is a crowning honor to the Glyphs that they can speak in the most fuzzily dreamlike way, making perfect (and different) sense to each reader. Even the most innocent scan through the book will be rewarding. This is even to say nothing of the many literary, mythical, and linguistic references; as what I find most uncanny about A Book of Glyphs is its accomplishment at being a real "Smile-Book of Grace-Joy," which is the title Sanders originally wrote on his blank notebook. O Book of Glyphs! Why? / Why a star? Why a book like this? I have no critical answer except: anything that makes me ask "Why?" with such admiration and delight has already done more than enough. A Book of Glyphs is published by Granary Books and distributed to the trade by D.A.P./Artbook.com. Claudia Rankine’s Citizen is a book about what lies beneath the everyday: how casual comments, overheard remarks, clips from the news, where people choose to sit (or not sit) make up your world and become a part of you, whether wanted or not. Looking for a new way to write race, one that resists truisms, didacticism and overly simple formulations, Rankine examines what it means to be a part of a collective that is inflected with hostility, envy, fear, and desire. She patiently chronicles what happens to a person emotionally, intellectually, and physically in encounters with other people, and how that is expressed through language, or sighs, moans, muscles tensed in wordless rage, overwhelming exhaustion. How do you speak from a position that has been rendered both silent and invisible as well as painfully hyper-visible and on display? What kind of poetic voice is cultivated as a result, and whom does it address? A hybrid combining word and image, this powerful book seeks to understand how race both shapes and is expressed in encounters between people by looking at the connections between mind, body, feeling, and language. Citizen is published by Graywolf Press and distributed by Farrar, Strauss & Giroux. Of course this is a book that can be read, but more than anything, Spontaneous Particulars demands to be looked at—and touched. Manuscript fragments, discarded scraps of silk, a pricked pattern, a prescription pad: to run your hand or mind over the affinities and relations Howe stitches together is to understand the quite literal beauty of text that flirts with illegibility. The pleasures of the mind are as sensual as any, and the visual, tactile, and acoustic resonances are as dense with information as the words themselves. And I can’t pick up Spontaneous Particulars without remembering entire days I’ve spent in the New York Public Library’s Rose Reading Room, utterly mesmerized by those majestic ceilings, overwhelmed with the feeling of what is possible. 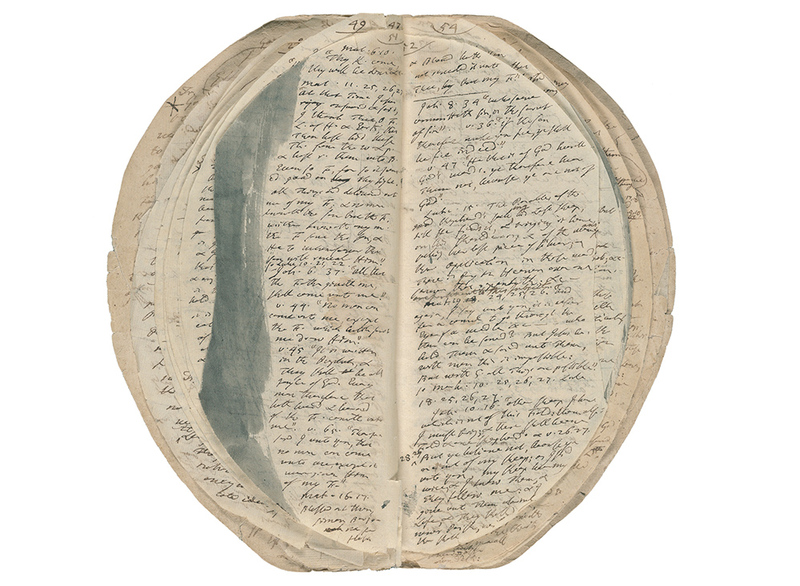 This is where Howe’s ode to libraries and archives, manuscripts and special collections is at its most powerful, when it reminds us of why we begin to read in the first place: because we find ourselves uncovering whole universes of possibility. Spontaneous Particulars is published by Christine Burgin/New Directions and distributed by W.W. Norton & Company.